This weeks challenge for Make it Monday is to use some glitter detail on your project . I have used a glue pad and the window frame stamp and then added glitter to the windows. I also used some glossy accents on the candy canes and then sprinkled glitter on these. Love the glossy accents on the candy cane… Just love that stuff. 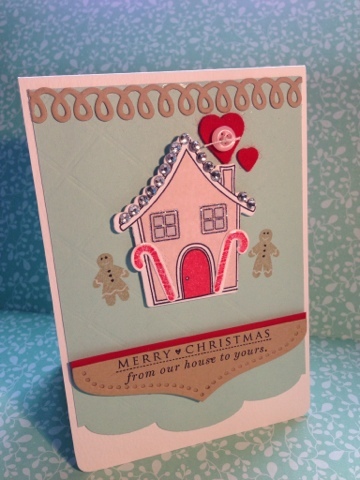 Adorable card and love the sparkly roof! I like the bit of sparkle to the window.. such a sweet card. It can go with the house you made. Late night crafting , gift tags !